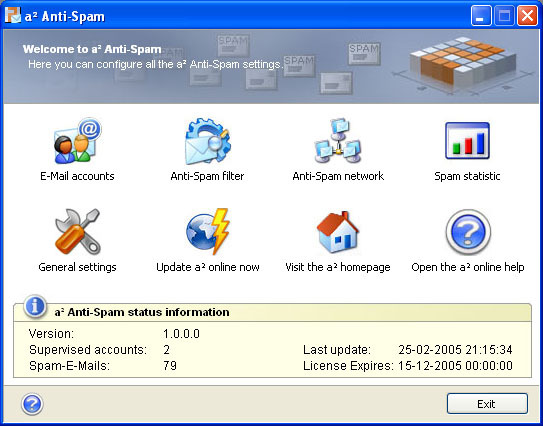 a-squared Anti-Spam is a desktop anti-spam solution designed for personal users who are not able to use server side spam filtering or don't trust the spam filter of their internet service provider. Nice. Has good possiblities. It will take a long time to give a good assessment, but it can definitely be one of the best. My favorite is SpamPal. My favorite was Spamhilator, but unfortunately, it went out of development over a year ago. It's unfortunate that a number of people seem to be confusing A-squared's new Anti-Spam program (now in beta) with their Anti-Trojan program, which moved beyond beta stage LONG ago, & is very stable and reliable on all versions of Windows. A-squared's superb Anti-Trojan program not only protects against trojans, but has a huge signature base that, in addition to trojans, protects against other types of malware including spyware. The non-free version's Anti-Trojan *Guard* has 4 scanners and excellent heuristics. It is very light on system resources, and is rock steady, even on Windows ME. Personally I consider that A-squared made a very questionable business decision in using their same name for a beta product as they do for their Anti-Trojan program. Their Anti-Trojan program is a great program in a security field that has very few programs that come anywhere close to the excellence of A-squared's Anti-Trojan program. On the other hand, the Anti-Spam market is densely populated by numerous free and non-free programs that are quite effective. I myself use Spamihilator, a free anti-spam program that is head & shoulders above other such programs. Beta version for Windows 98, ME, NT4, 2000, 2000 Server, XP and 2003 Server. Free while it is in beta stage! 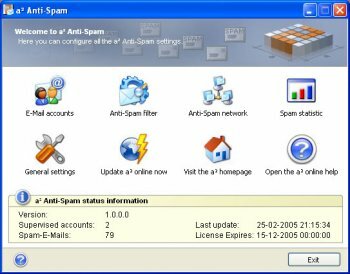 a-squared Anti-Spam is a spam protection system designed for Outlook and Outlook Express, but it runs with any other windows email client too. I dont know this software earlier but I am always interesting to have expiriences with the new one. But, is this call a-personal and a-free? and it is all-in-one for all malware. Why Betanews say it is freeware (I have seen this lier more frequency). It is a free version come with basic function and a personal come with 30 days trial! !